»CALL TO ACTION! CDC: NO MORE TIERS! CALL TO ACTION! CDC: NO MORE TIERS! 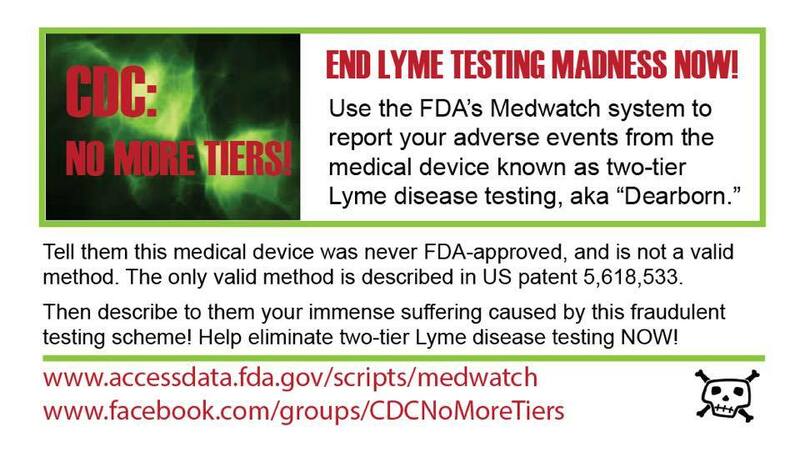 Recently, in yet another obvious attempt to keep their two-tier testing procedure firmly in place as the only approved Lyme disease testing method in the U.S., the U.S. Food and Drug Administration (US FDA) announced at the end of July 2014 that it will be investigating, via a government-appointed oversight committee, the validity of many diagnostic tests, including non-FDA approved Lyme tests (IGeneX, Advanced Laboratory Services, etc). The witch hunt continues . . . . . . . . . . . . . .
Let’s flood Medwatch with as many of our reports as possible! If you deem that you or a loved one has been negatively affected by theCDC’s two-tier Lyme testing protocol, please participate. The more reports (complaints) that they receive, the more of a chance we have of forcing Medwatch to have to investigate this issue. . . . . . . . . . . . . . . .